Experience the vitality and creative freedom of playing African drums with Unbeatable Energy's evening classes. Are you interested in experiencing the excitement, vitality and amazing sound of African Drumming? If so, why not come to one of our evening classes in Sheffield. We run classes on Thursday and Tuesdays evenings. The first Tuesday night for 2019 is 8th January 19:45-21:00. The first Thursday night is 17th January 19:30-20:40. You can register on to classes here, or read on to learn more about the sessions, including times, venue addresses and prices. A brilliant way to exercise, energise and feel invigorated! A new way to unwind and have fun! 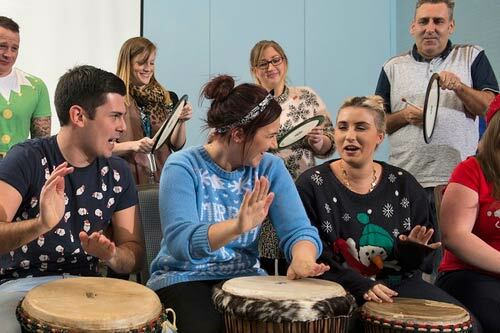 PLUS - African Drumming is the perfect remedy to beat the winter blues! Easy beats for beginners, warm up session for advanced. In both classes all drums are provided! This class is suitable for beginners and as a warm up for more experienced players. In this session we explore the basic sounds on the djembe drum starting with the ‘bass’ (middle of the drum), the ‘tone’ (side of the drum) and finally ‘slap’. After some initial work on technique, we explore djembe rhythms from Guinea Conakry, Senegal and Mali in West Africa. There is a common and healthy mix of abilities in the Easy Grooves Class. We plan the material for Easy Grooves so there is something for everyone’s level - easy, accessible parts for complete beginners and more challenging parts for experienced players. This class explores traditional solos for djembe and the dunduns and assumes you already have a few years’ experience of regular djembe playing. If you are new to the class and would like to discuss whether this session is suitable for you, please feel free to contact Steve Rivers to discuss. The above link will take you to our TeamUp online booking site. Here you can purchase and register classes on the calendar. You can purchase the Block bookings option here as well, by selecting the block bookings tab at the top of the screen. After purchasing a block booking, you select the schedule tab to use your 6 credits to register classes on the calendar. Easy Grooves 6 Block packs can be used to register either Tuesday or Thursday dates and you can register both nights in the week if you want to. If you have any further queries about the classes or anything else on drumming, please email us at contactus@unbeatable-energy.co.uk or call Steve on 0781 0406 501. Want a sneek preview of the class? This is what the Easy Grooves class achieved after only 10 weeks! Complete beginners and more experienced players took part in this session. You will be amazed at what can be achieved in a good supportive learning environment. Looking for private parties instead? Drumming and Boomwhacker workshops are perfect for any party or function.